The emergency lowering device recently introduced by J D Neuhaus for their EH range of air operated hoists can now also be supplied as a standard feature on their Profi Ti line from 25 to 60 tonnes lift capacity. 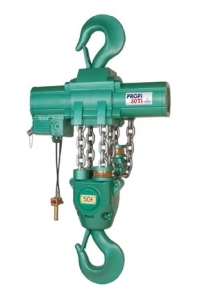 Hoists incorporating the emergency lowering device option are equipped with a separate air tank, with two additional buttons also incorporated into the hand controllers. This air reservoir is automatically maintained at the full working air pressure during normal hoist operations. This ensures the availability of a positive emergency braking system when required, and the air tank is also protected by a check valve. Certification by Det Norske Veritas can also be provided on request, to comply with safety requirements involving applications for offshore cranes as well as power driven hoists. The device becomes operable in the event of a severe reduction or total loss of mains air pressure. It then provides practical two-handed operation to avoid unintentional lowering. One of the control button switches then selects between normal hoist operation and emergency lowering. The second control button opens the integrated operational brake to facilitate a controlled lowering of the suspended load under the action of its own dead weight. Where the Profi hoists are equipped with trolleys for lateral movements, the reservoir air tank can be mounted on the chain box container. 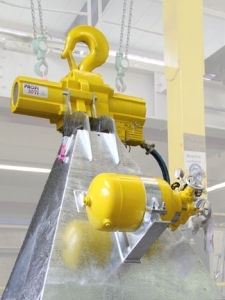 For static hoists, the reservoir can be mounted anywhere convenient within the surrounding working area. The Profi Ti range of JDN products are suitable for all engineering applications throughout a wide range of industries including oil and gas exploration and processing, mining, shipbuilding, foundries, the chemical industry and heavy plant construction. They are designed to comply with Ex operating ratings, suitable for working in hazardous areas or potentially explosive environments. They are insensitive to humidity and dust laden atmospheres, and can operate at temperatures from -20°C to 70°C. Instant starting, minimum maintenance and low air consumption are their positive features, coupled with compact low-headroom design. Other standard features include emergency shut-off valve together with both anti-climb and anti-drop devices. Optional accessories include increased spark protection (and higher Ex rating), overload protection, rack and pinion trolley drive with two speed travel control and filter silencers.